An €11 million Interreg North-West Europe (NWE) project has been launched in Orkney to develop an all-in-one solution for the generation of clean predictable energy, grid management, and the production of hydrogen from excess capacity. The project consortium includes EMEC, Orbital Marine Power, AREVA H2Gen, the Energy Systems Catapult, Energy Valley/New Energy Coalition, University of Caen Normandy, University of Le Havre Normandy, Ghent University and the Normandy Development Agency. Funded by the Interreg NWE programme, part of the ERDF (European Regional Development Fund), the project will deliver an onshore energy management system at EMEC’s Fall of Warness tidal test site, off the northern Orkney island of Eday. This will support the production of hydrogen using an AREVA H2Gen electrolyser, the first to be deployed in the UK, which will be powered by Scotrenewables’ next generation 2 MW floating tidal energy converter, the SR2-2000. The cost of pre-commercial demonstration for ocean energy is high and investors are reluctant to invest until the technology has been proven in the sea at scale. ITEG sets out to drive down these costs through the development of an integrated hydrogen production solution. 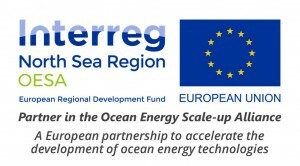 FORESEA (Funding Ocean Renewable Energy through Strategic European Action) is an €11m Interreg North West Europe project. Its helps bring offshore renewable energy technologies to the market by providing free access to North-West Europe’s world-leading network of test centres. Since its launch, FORESEA has increased real-sea testing activity in the ocean energy sector. Ten projects have hit the water at European test centres with FORESEA support, with more to come in the next 18 months. Where can I test through the FORESEA programme? The test centres are supported by the European industry body for ocean energy, Ocean Energy Europe, based in Brussels. RiaSoR will establish industry best practices in reliability testing for wave and tidal devices through improved load measurements and verification, standardising design guidelines for marine energy systems, and increasing safety in marine energy operations. The Variation Mode and Effect Analysis (VMEA) methodology used in other more mature sectors such as the automotive and aerospace industry will be adapted in this project for the ocean energy sector. MET-CERTIFIED brings together partners from 4 European countries to advance the marine energy sector in the 2SEAS region: Dutch Marine Energy Center (NL) as project coordinator, the European Marine Energy Center (UK), Lloyd’s Register EMEA (UK), IFREMER (FR), Tocardo Tidal Power (NL), Perpetuus Tidal Energy Centre (UK), NEC (NL), DNV GL (UK), Regional Development Agency West Flanders (BE), and Ghent University (BE).At present no certification scheme for marine energy have been developed and implemented by all main stakeholders in a consistent way. The expectation is that it will come into existence over the next 3 years under the umbrella of the International Electrotechnical Commission (IEC). Therefore, the timing of MET-CERTIFIED is very favorable. MET-CERTIFIED will help to accelerate the development of certification for the sector, and thus will increase and accelerate the adoption of insurable and bankable tidal power projects. 1) Sustainable and predictable electricity generated from tidal flows in the 2SEAS region, both at floating sites (open water) as well as from dam-integrated systems (inshore). 2) Mature and verified standards and certification scheme in support of IEC and IECRE developments for marine energy converters. 3) Design, Building and installing a state of the art floating platform at a commercial tidal site with an operational tidal turbine that will be used as a reference case for the first internationally recognised certification of a tidal power technology. 4) Verification and certification of other marine energy projects. 5) Dissemination of results, recommendations to the European Commission, reinforcement of cross collaboration between networks across the 2SEAS region, etc. MET-CERTIFIED is cofinanced by the European Fund for Regional Development (ERFD) under grant agreement No 2S01-020. Also the Ministry of Economic Affairs in the Netherlands, Province of South-Holland and North-Holland and the Belgian Province of West Flanders are offering financial support. MET-CERTIFIED targets stakeholders around certification, from banks and insurers to consenting authorities, end-users, test facilities and classification bureaus. • To accelerate and contribute to the development of mature and verified standards and certification. • Share data on experience on open water test sites in order to stimulate access to and the development of other marine innovation locations. • Dissemination and recommendation to wide network of stakeholders and EU. EMEC will lead on the work package ‘Type Certification of existing tidal power technologies’ which looks are developing a suite of internationally recognised standards by applying them in a systematic way to a number of existing pilots. Furthermore, EMEC will focus on the implementation of the developing IEC standards and IECRE certification schemes, as well as, organising the UK workshop. The Ocean Energy Scale-up Alliance (OESA) is an accelerator project aiming to develop and deploy large scale marine energy pilots to accelerate the development of marine energy technologies through strategic partnerships and international collaboration. Led by the Dutch Marine Energy Centre (DMEC), the transnational partnership combines expertise from six European countries from the North Sea Region. To develop a transnational scale-up offer for marine energy technologies, in which the services of large European service providers in offshore and marine energy are combined. To accelerate the development of five technologies, leading to the deployment of 20 MW in large scale pilots. To bring together stakeholders from the offshore industry, investment business and policy makers in a stakeholder platform and show the collaborative potential of marine energy in order to secure their support for future deployments in the ocean energy sector. Within OESA, thirteen organisations combine their expertise in offshore engineering, market development, ocean energy testing and technology development. To make sure that the offer is tailored to the most urgent needs of the industry, five technology developers are members of the alliance. Together with the eight service providers they are analysing and defining services that will lead to the deployment of their technology pilots. The eight service partners are combining their expertise to offer a portfolio that covers both technological as well as commercial services. This will not only lead to the immediate acceleration of pilot development but also ensure the sustainable growth of technology companies. Through its transnational collaboration OESA strives to strengthen the ocean energy sector. This will allow to share lessons learned and lead to the faster production of more renewable energy in the North Sea region. The Reliability in a Sea of Risk project (RiaSoR) aims to address the strategic need for the ocean energy industry to focus on the key engineering challenges that underpin the reliability and survivability of emerging wave and tidal energy technology. The project brings together three leading European research and testing sites from the north of Scotland, England and Sweden in order to develop industry approved reliability testing practices. These practices will be applied by the research and testing sites, ensuring consistency and robustness of testing to demonstrate reliability across wave and tidal technologies. The overall technical approach will be driven by SP Research, who bring their experience in reliability testing from the automotive industry. They will focus on developing framework methodologies that will be deployed at the onshore Offshore Renewable Energy Catapult test site in Blyth (England) and the European Marine Energy Centre’s offshore test sites in Orkney (Scotland). EMEC role: The main areas of input from EMEC is WP1 (project management), WP5 (Moorings and Foundations methodology/analysis) and WP7 (guidelines and dissemination). Aim: MARINET is a new European Community (EC) funded initiative which aims to accelerate the development of marine renewable energy by bringing together world-class testing facilities at all scales to offer periods of free access, coordinated research to enhance testing capabilities, common standards, industry networking and training courses in testing techniques. EMEC role: EMEC has involvement in a range of MaRINET activities including WP2 (test site standardisation), WP3 (facility access) and WP4 (research). Work Package 4: Research to innovate and improve infrastructures, technologies and techniques. D4.7 Best practice report on environmental monitoring and new study techniques. 2014. Aim: This project has delivered a suite of protocols for the equitable evaluation of marine energy converters (based on either tidal or wave energy). Our main contribution was in the resource and environmental assessment work packages. EMEC role: The main areas of input from EMEC was in WP2 (physical environment specification) and WP6 (environmental impact assessment). Aim: The SOWFIA project aims to achieve the sharing and consolidation of pan-European experience of consenting processes and environmental and socio-economic impact assessment (IA) best practices for offshore wave energy conversion developments. Studies of wave farm demonstration projects in each of the collaborating EU nations are contributing to the findings. The study sites comprise a wide range of device technologies, environmental settings and stakeholder interests. EMEC role: EMEC provides a technical advisory capacity for the project and is also supporting a number of deliverables.